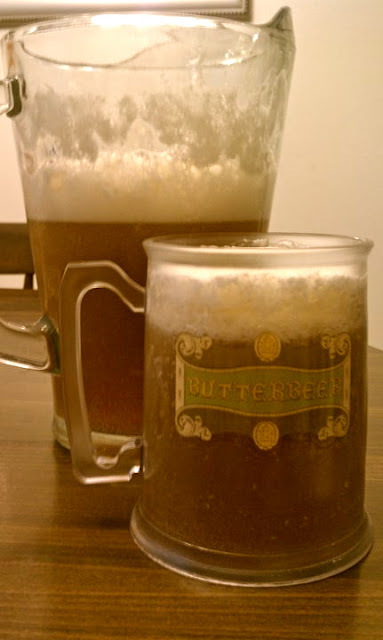 Picturing Disney: Adult Butterbeer Recipe! Want to make your very own adult Butterbeer? By adult I do mean alcoholic! Read on for a super easy, at home recipe! I am not sure if anyone could visit the Wizarding World of Harry Potter without indulging in their signature Butterbeer! It was the highlight of my visit! I even went back for a refill! I saw this terrific recipe on Elise's Kitchen and decided to give it a whirl. Combine Fluff with 1 tbsp of butterscotch schnapps. Microwave the mixture for 30 seconds, stir again and set aside. Next pour the rest of your schnapps into the bottom of your pitcher and fill the rest of your pitcher with cream soda. Stir the ingredients to make sure the schnapps and soda combine equally. Pour the marshmallow mixture carefully on top. Let it sit for a minute or so afterwards since sometimes the foam rises on top a little. I've made this about 4 or 5 times and have had the fluff bubble up my drink once or twice. Last thing to remember is to drink responsibly! As Elise put it, no hopping on a broomstick and heading out for a ride after drinking this schnapps-based drink!! Please Always, ALWAYS, ALWAYS drink responsibly!